This summer, we have been printing a range of dual-language invitations. It's a fun challenge for us to lay these out and we have the added benefit of daydreaming about events on Greek islands, Italian hillsides and French chateaus! 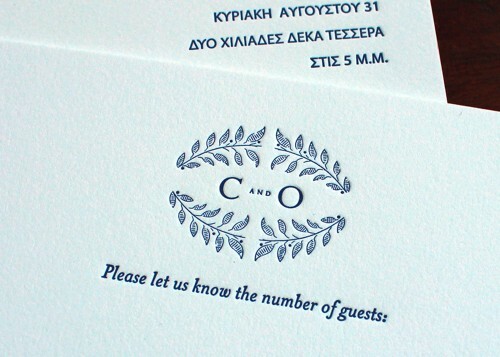 This invitation includes text in both English and Greek. We aimed to have both sections of copy arranged similarly so that they mirror each other and there is plenty of space left on the design so that it doesn't look too "text-y". The bride asked the extremely talented Roanne Adams from RoAndCo to design the custom monogram and we think it is so charming. 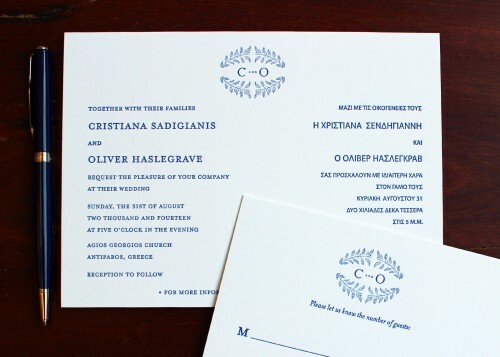 The subtle olive branches refer to the Greek heritage of the bride and the location of the wedding.